Oh my goodness I can not get over the gorgeous weather today! Winter said ‘oh just kidding, I forgot that I had somewhere else to be…’ and it is just so nice today- in the 70’s!!! I went for a walk OUTSIDE at work today and it was just amazing. But even though the weather feels nice and warm, I am still definitely in the holiday spirit! For this month’s Five for Friday, I wanted to share my 5 favorite Christmas movies and why I love them so much! This was THE BEST made for TV holiday movie from my childhood (1997 to be exact)! I seriously would look forward to it every year and make sure that I was at home to watch it. The plot: a perfume sales girl makes a Christmas list and drops it in Santa’s mailbox at her local store, and then all the things on her list come true- at first! It’s just a great feel-good movie, and OF COURSE since it is a TV movie, you know there is a small child with only one parent because their other parent died and so their remaining parent will fall in love with the main character. #spoilers I don’t think this has been on the air for a while, so I used to watch it on YouTube, but I think that link doesn’t work anymore. And I’m actually really sad about it. There isn’t even a promotional title image for the movie, so enjoy this tiny picture. Christmas is coming, the goose is getting fat! (Sung in my best Miss Piggy voice!) This is by far the movie that I associate with Christmas the most. I can’t tell you how many years in a row my family watched this movie on Christmas Eve. SO many. I mean, it’s a classic story, but with Muppets involved. Of course it’s going to be amazing. And it’s a musical. 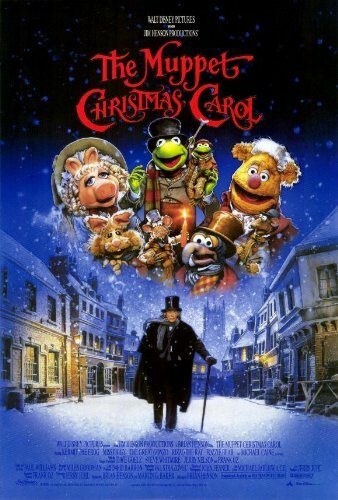 And it has the great Michael Caine as Scrooge. And the soundtrack for the movie has John Denver singing with the Muppets. Here is a list of why this movie is awesome. 1. It’s a Lifetime movie, so you know it’s going to have sweet moments. 2. It has Luke Danes (ok his real name is Scott Patterson…). 3. The main guy is adorable. 4. The main girl is Winnie from The Wonder Years. 5. This movie has lots of flashbacks, which means fun hairdos and clothes to make you feel nostalgic. 6. It’s just a fun movie. That is all. Is there a better feel good happy sappy movie to watch around the holidays? Probably not. This movie just makes me so happy. And makes me love Cameron Diaz, even though I usually don’t like her acting. And how good is Jack Black in this role? He is so sweet and still funny, but in a waaaaaay calmed down way. And Jude Law… oh isn’t he just a dream in this movie? Only he can put a napkin on his face and still be so charming that you just want to hug him for 7 hours. AND THIS MOVIE HAS THE MOST ADORABLE OLD MAN!!! And it just makes me feel all warm and fuzzy inside and makes me feel lovey dovey and ok I think I’m going to watch this movie right now! So there is my list! Are any of those on your list of favorites, too? Any great ones that I missed that I should make sure to watch this holiday season? (Also, I would like to say that honorable mention would go to It’s a Wonderful Life and Love Actually!) Enjoy your weekend! I love The Holiday! How cute are the accents of Jude Law’s kids in the movie?! I agree about Cameron Diaz – not normally a big fan of hers but I still love the movie. Interesting picks! I wouldn’t really thing of any of these as classic top five Christmas movies except elf and maybe holiday. My mom is obsessed with hallmark Christmas movies so I can understand the love for made for TV movies! The Holiday is such a great Christmas movie!